Businesses today are morphing into information-driven entities at an unprecedented pace. This leads them to create, organize and store more and more data every day. To handle the conversion of "data to information" effectively, they need an agile and scalable datacenter infrastructure. 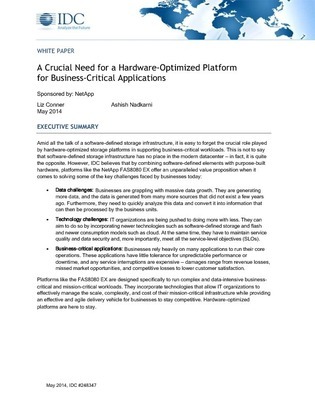 Read this paper to learn how the FAS8080 EX, NetApp’s new flagship storage system for enterprise applications and cloud, can address massive data scale while delivering high-end performance.